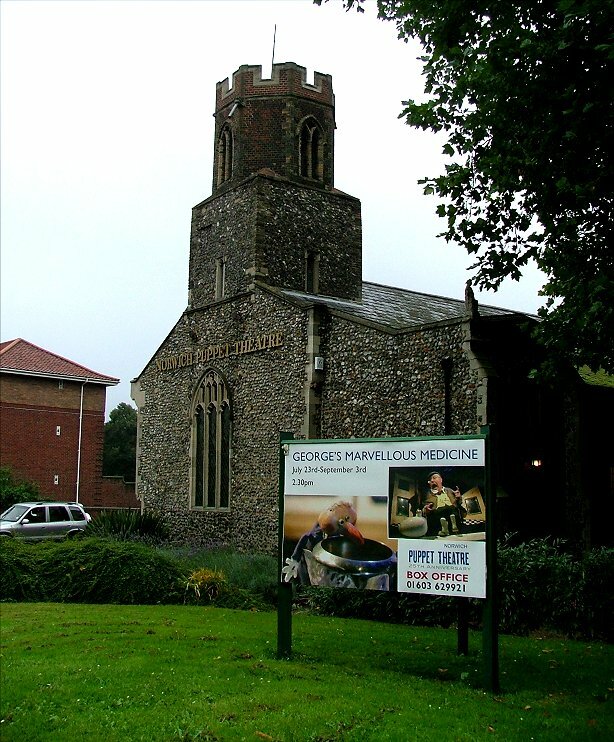 There can be few more curious towers in Norfolk than that of St James the Less. 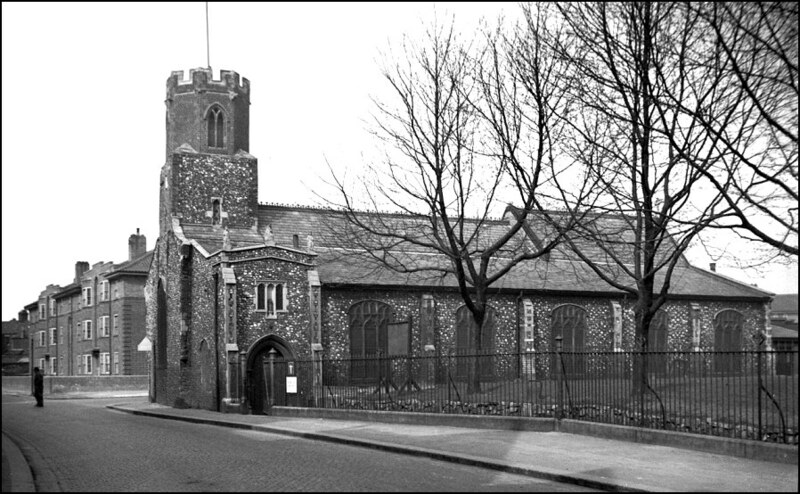 The church is broadly 15th century, but the tower was built within the nave, as at Thurton and Bramerton. 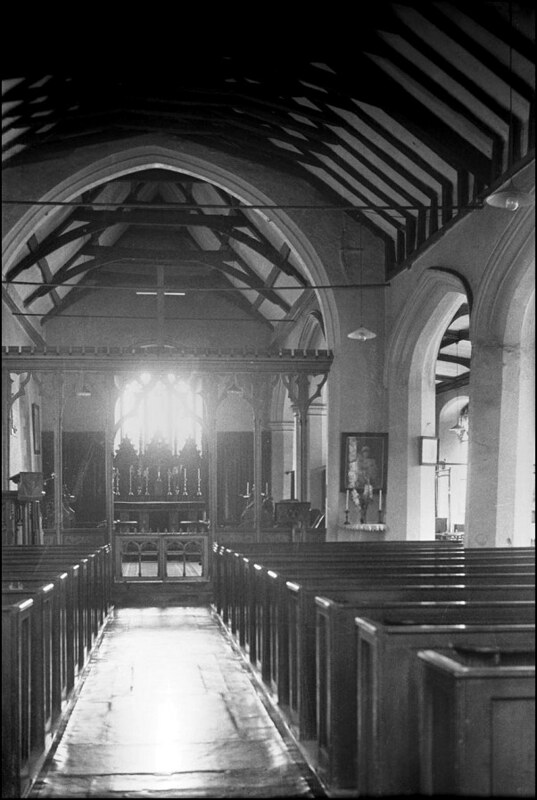 This results in a three-way partitioning of the west end, as if it was intended to house chapels in one cause or another. As if this wasn't odd enough, the top was given a fancy polygonal turret in the 18th century. At first sight, it might appear a round tower; but it isn't. Perhaps it was intended as a landmark, and for much of the 19th century this church was apparently the home of a particularly firebrand form of protestant muscular Christianity. Until the 1930s, this was a densely populated area of terraced streets and small factories. Virtually all of this has gone today; firstly, Barrack Street was widened in 1938 for the inner ring road, and then the entire area was almost completely destroyed by German bombs one night in January 1942, St James miraculously escaping. St Paul, 50 metres to the west, was burnt out and has today completely disappeared. 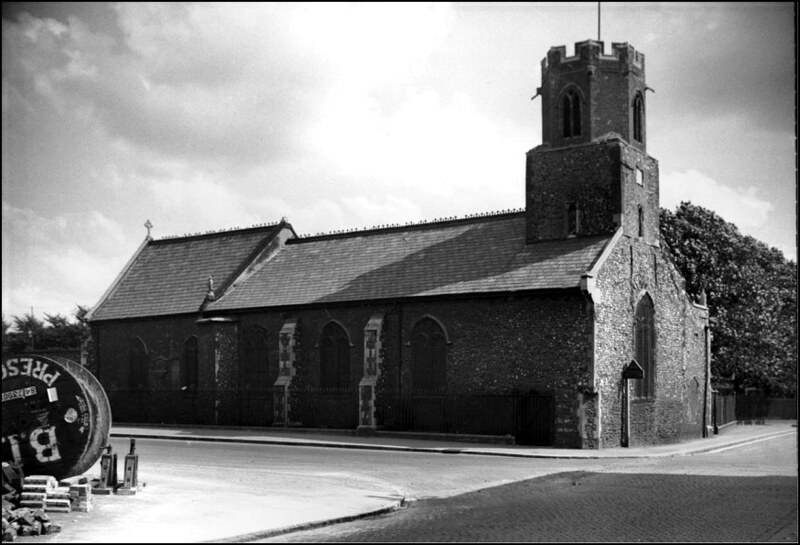 In the photographs below, you can see George Plunkett's view in 1931 - apart from the church, every single other thing in this photograph has gone today. 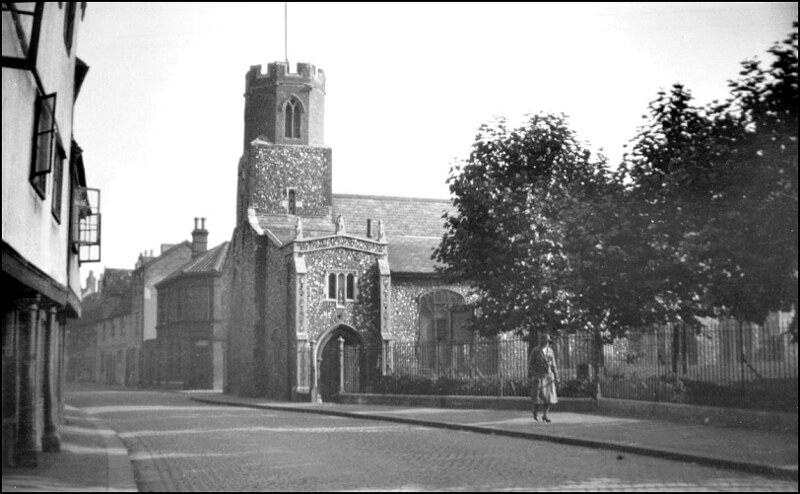 The second photograph, taken in 1938, shows the church after the widening of Barrack Street - the new flats beyond the church on Wroxham Road also escaped the blitz, and survive today. The last picture, in the weeks before the war, shows the north side, with roadworks going on. The spot this photograph was taken from is now within the four lanes of the modern inner ring road. 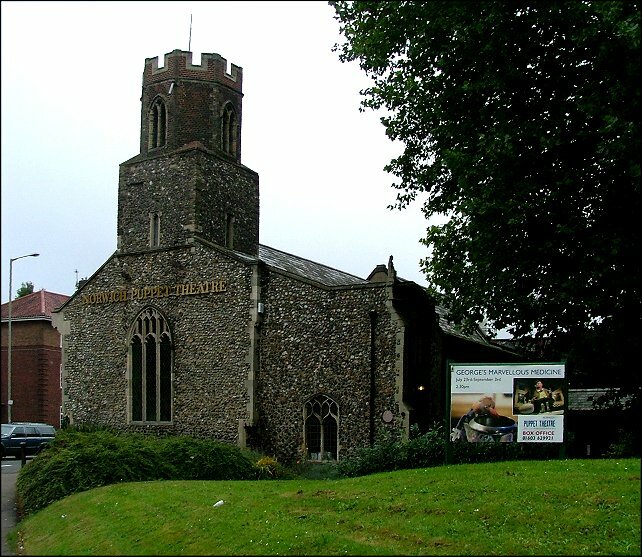 For a couple of reasons, St James is now one of the best known of Norwich churches, despite having been redundant for half a century. Firstly, it sits on a mound right beside a roundabout on the busy inner ring road. 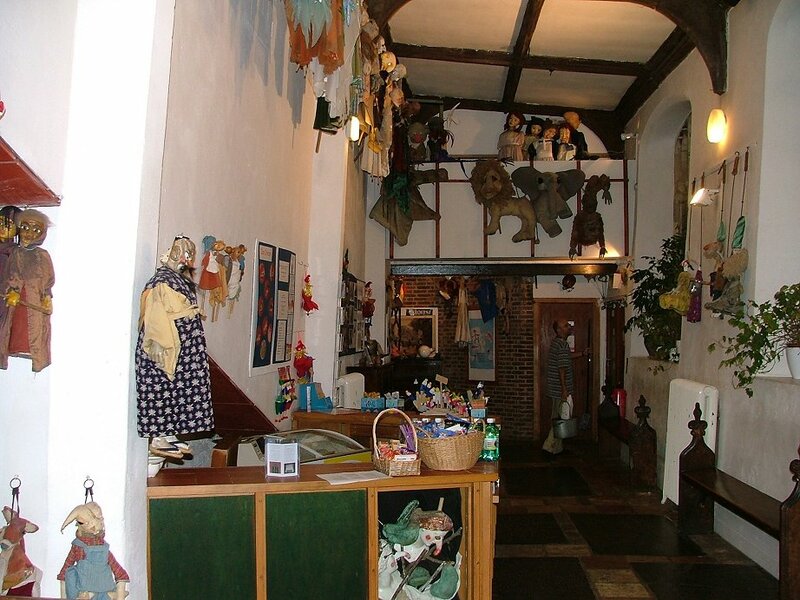 But secondly and more fondly, it has been the home since the early 1980s of the Norwich Puppet Theatre. 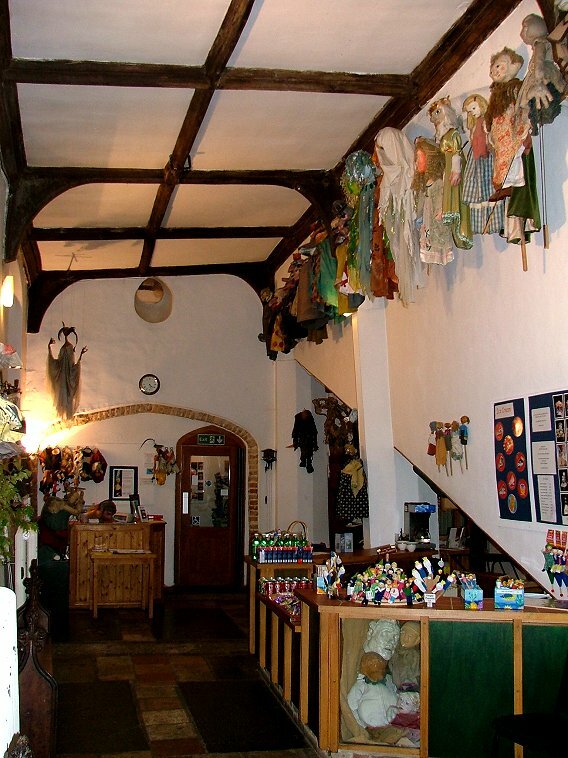 The Norwich Puppet Theatre is one of those brilliant provincial arts organisations that seem to flourish against all the odds to achieve importance at European level and beyond. For a quarter of a century now they have kept up a regular programme for adults and children of familiar and original stories. 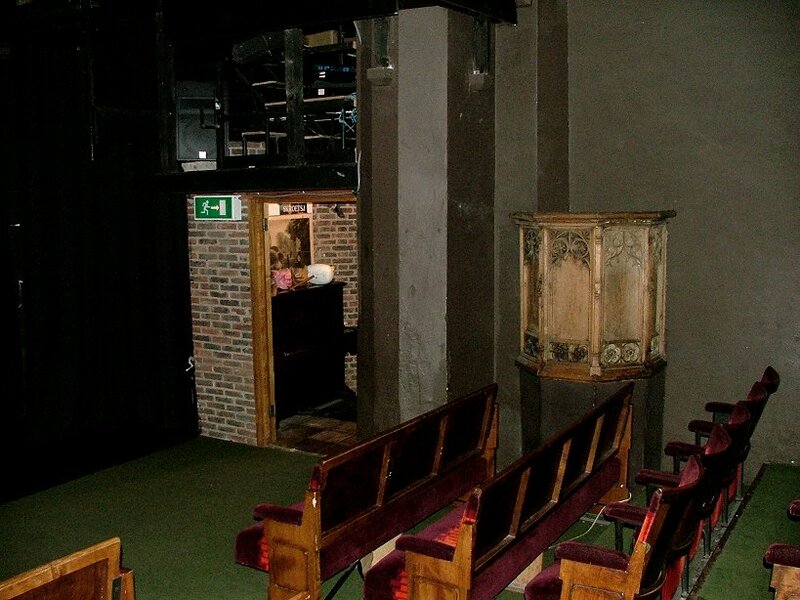 Their productions are superb, quite frankly; I have never seen one that I would not want to see again. The work they do in East Anglian schools is exemplary, inspiring generations of children to tell stories in new and interesting ways. I cannot commend them highly enough. 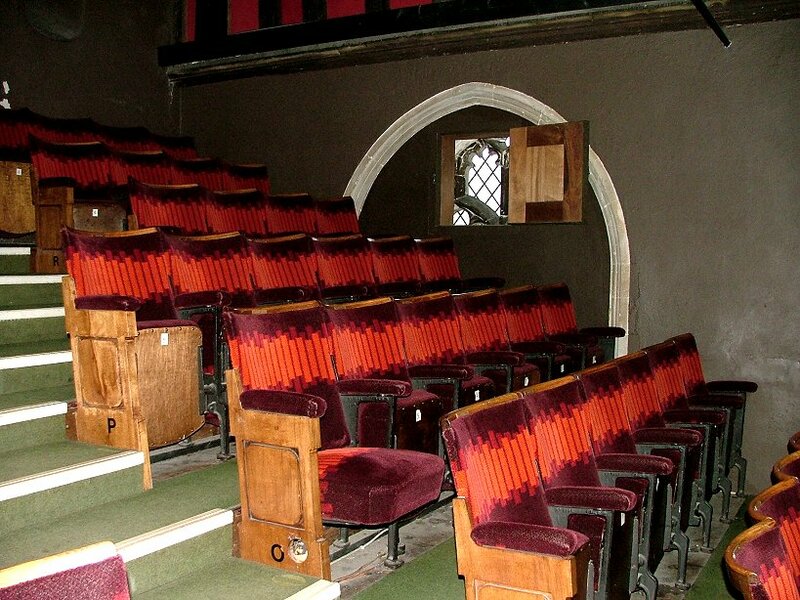 They have converted the interior into an auditorium with banked seating with space beneath for workshops. 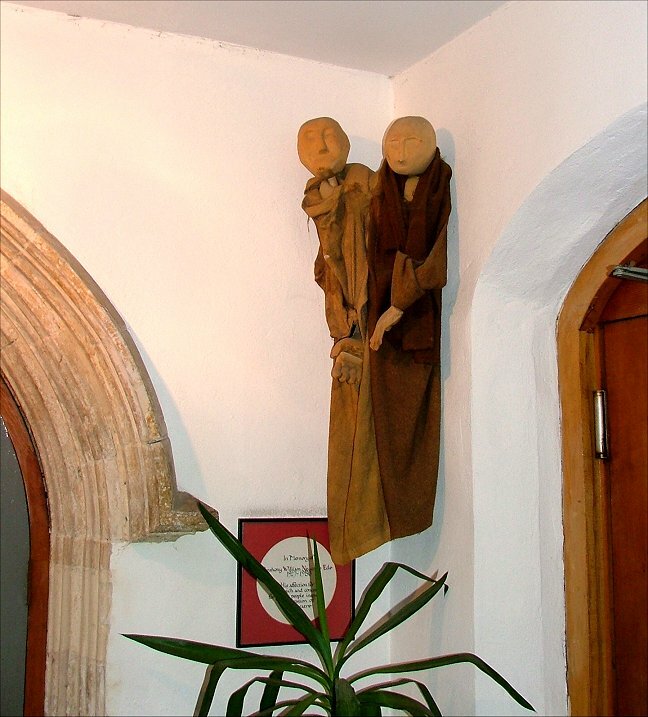 The south aisle is now a reception area. 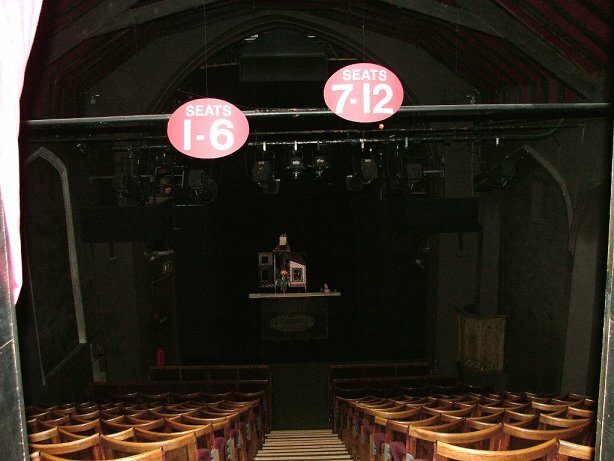 The chancel forms the stage and back stage area. 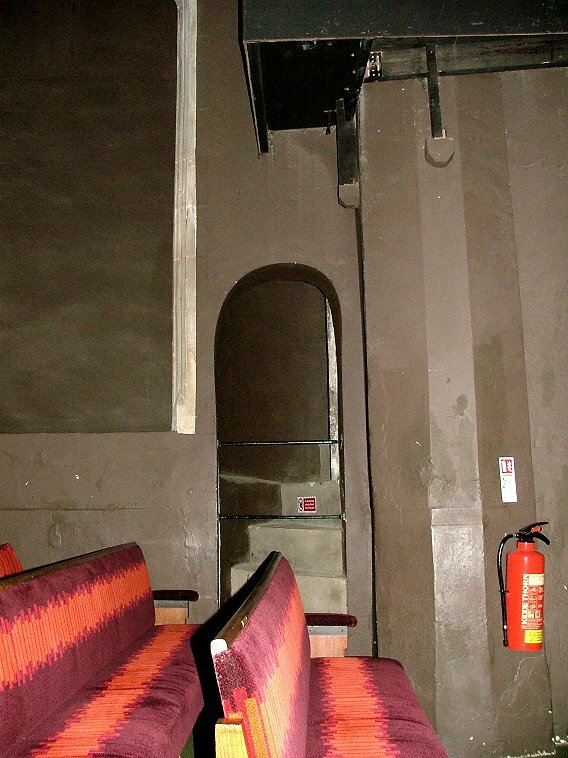 The seating climbs up to the top of the tower arch, where there is a door from a stairway inside the tower. 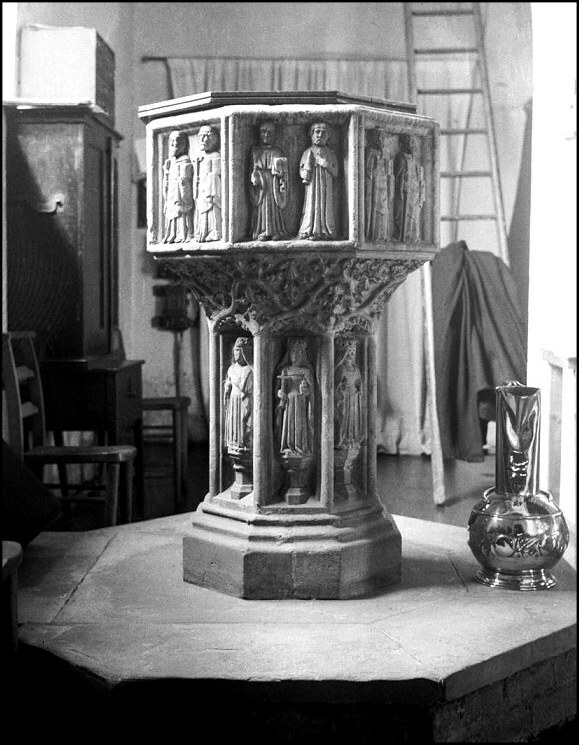 The fine font, with the twelve apostles on the panels, has been moved to a church in Sprowston, but the Victorian stone pulpit survives on the south side of the auditorium and is occasionally pressed into use for productions. 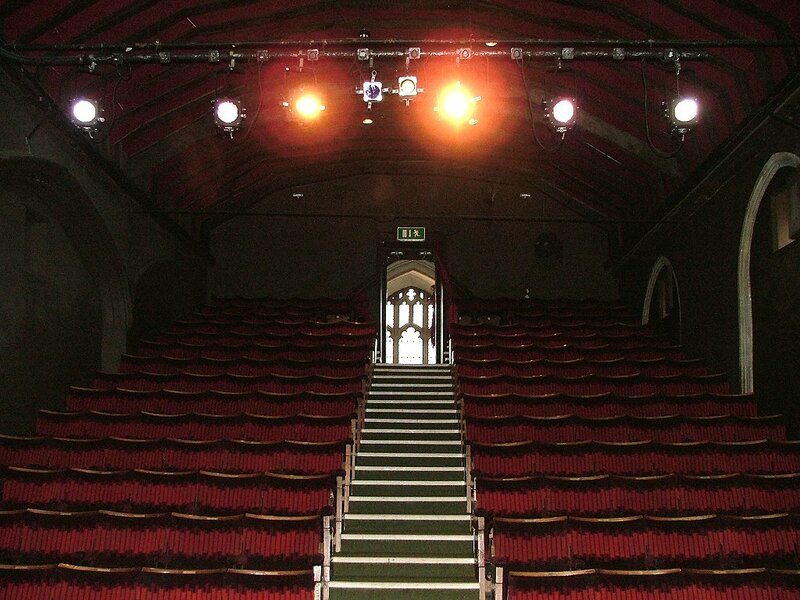 The former rood loft stair case now allows access to the lighting rig. 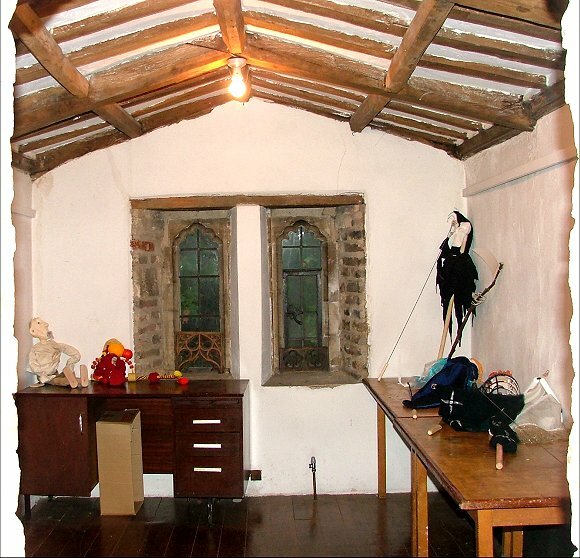 The upper storey of the porch is also used as workshop space. St James seems to me the most wholly successful conversion of a medieval church that I have ever seen, a happy place totally in accord with the spirit of its medieval life, as if the years of dour protestantism had never intervened.